Jake Rudock has found a new gig. ESPN’s Adam Schefter reports (via Twitter) that the Dolphins have signed the quarterback to a reserve/futures contract. Rudock split his collegiate career between Iowa and Michigan, winning the 2016 Citrus Bowl MVP after the Wolverines topped Florida. 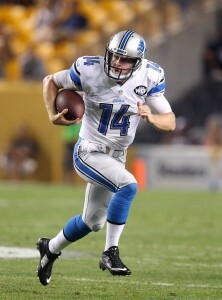 Following a 2015 campaign that saw him complete 64-percent of his passes and throw 20 touchdowns, Rudock ended up being selected by the Lions in the sixth round of the 2016 draft. Playing behind Matthew Stafford, the 25-year-old predictably hasn’t seen the field a whole lot during his brief career. Rudock made three appearances in 2017, completing three of his five passes for 24 yards and one interception. The Lions waived the signal-caller at the end of the 2018 preseason, as the team decided to roll with only Stafford and veteran Matt Cassel. Rudock ended up spending the entire season on Detroit’s practice squad. Now, he’ll have a chance to compete for a spot on the Dolphins’ roster in 2019. There have been plenty of rumblings that Miami could end up moving on from Ryan Tannehill this offseason. If the team moves on from the veteran, they’ll be left with only Rudock and rookie Luke Falk. While the organization would surely bring in a replacement for Tannehill, Rudock could still have a chance at a backup gig. It appears Matt Cassel will be Matthew Stafford‘s backup. The Lions are cutting the player who previously filled that role. Jake Rudock did not make Detroit’s 53-man roster, Ian Rapoport of NFL.com tweets. But the Lions are interested in bringing him through to their practice squad if he’s unclaimed on waivers. The 2016 draft choice generated trade interest last year, but the Lions ultimately kept him. He was rumored to have fallen behind the 36-year-old Cassel during training camp, and the Lions will go with the well-traveled veteran behind Stafford instead of a third-year incumbent. Rudock did pass through waivers in 2016 when waived, but there’s obviously a chance the Lions won’t get to retain him. Lions backup quarterback Jake Rudock is generating trade interest around the NFL, according to Ian Rapoport of NFL.com (Twitter link), who adds rival clubs attempted to “poach” Rudock last season. Rudock, a sixth-round pick out of Michigan in the 2016 draft, didn’t attempt a pass during his rookie campaign but did perform well in his most recent preseason contest, as he completed 10 of 13 passes for 113 yards and one touchdown. Entering his age-24 season, Rudock is signed through 2019 under the terms of his rookie contract. While Rudock didn’t see a snap last season, that doesn’t mean he’s not valuable to Detroit, which only has two other quarterbacks on its roster: starter Matthew Stafford and rookie Brad Kaaya. Kaaya, a sixth-round choice earlier this year, presumably isn’t prepared to serve as Stafford’s backup in 2017, so the Lions would potentially need to secure another quarterback if they deal Rudock. In the past few drafts, the Steelers have made a concerted effort to bolster their defensive backfield, an area that has been something of a weakness in the second half of the Ben Roethlisberger era. The team selected a cornerback on the first or second day of the last three drafts (Cam Sutton in 2017, Artie Burns in 2016, and Senquez Golson in 2015), and safety Sean Davis was selected in the second round of the 2016 draft. Pittsburgh’s secondary was improved last season, but after it was gashed by the Patriots in the AFC Championship Game, the Steelers’ coaching staff plans to implement more man coverage in 2017, as Gerry Dulac of the Pittsburgh Post-Gazette writes. Dulac says the team is confident that Sutton and Burns can handle those concepts, but the staff is openly pessimistic about Golson, who has not played in a preseason or regular-season game in his two years in the league due to injuries. Golson, who is at least healthy enough to practice at the moment, seems to be on the verge of losing his roster spot altogether, and he may need to prove his worth on special teams just to make the club. Kenny Britt and Corey Coleman sit squarely atop the Browns‘ wide receiver depth chart, but the No. 3 job is wide open, and there are a number of second-years players who could fill that role. However, Dan Labbe of Cleveland.com says the team hopes Ricardo Louis, last year’s fourth-round selection, can be the guy. Though Louis appeared in all 16 games for the club last season, he caught just 18 passes for 205 yards, but given the big-play potential he flashed at Auburn, Cleveland will give him every opportunity to earn a key role this summer. Speaking of Coleman, Mary Kay Cabot of Cleveland.com says he will be eased into the grind of training camp, and he may not be a full-go from the first day of camp. The same is true of 2017 No. 1 overall selection Myles Garrett, who suffered a left lateral foot sprain in minicamp. Lions safety Miles Killebrew, a fourth-round selection in 2016, was a fixture in the team’s dime package last season, but as Kyle Meinke of MLive.com writes, Killebrew could be in for a much bigger role in 2017. The Southern Utah product is currently listed as the third safety on the depth chart behind Glover Quin and Tavon Wilson, but Meinke believes Killebrew could push Wilson for the starting strong safety job with a solid training camp. As we learned yesterday, the Lions and Quin are discussing a new contract. Jake Rudock lost the Lions‘ backup quarterback competition to Dan Orlovsky last season because of Orlovsky’s experience and knowledge of the team’s offense, but now Rudock himself is the player with the experience advantage. As Tim Twentyman of DetroitLions.com writes, Rudock’s grasp of OC Jim Bob Cooter’s scheme is miles ahead of rookie Brad Kaaya‘s, thereby making Rudock almost a lock for the backup job.